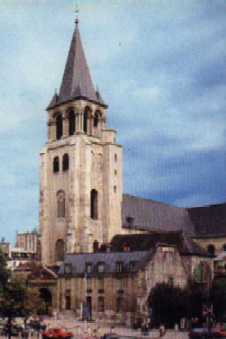 Saint-Germain-des-Prés is the oldest church in Paris. It is named after Saint Germain, who was buried at this spotin 576 AD. You can see some ruins there also. This is what the church looks like from the cafe Les Deux Magots (below). 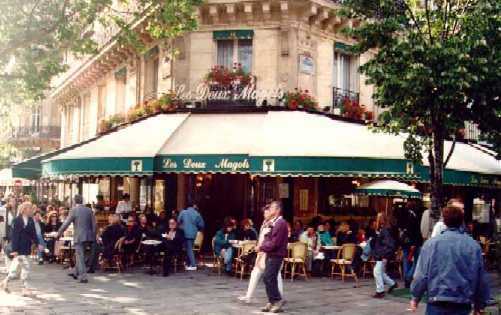 The famous Deux Magots (named after the two wise Chinamen just inside the entrance) was founded in 1875 and has been host to many writers, artists and philosophers in their early days including Hemingway, Mallarmé, Sartre and Picasso (who is said to have created Cubism here). Jim Morrison of the Doors spent alot of time here too.